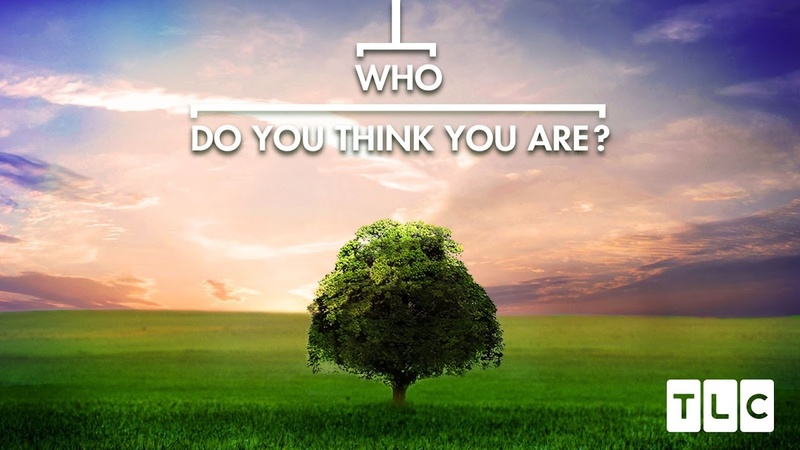 The blog of author and journalist Colin Woodard. Senator Susan Collins, considered a critical potential swing vote for those hoping to protect women's reproductive rights in the upcoming Supreme Court confirmation process, will not be using support for Roe vs Wade as a criterion in her evaluation of the next nominee. This clarification of her position -- which is that she will not use any "ideological litmus test" in the process, whether Roe or anything else -- is reported in yesterday's Portland Press Herald. It makes it far less likely that President Trump's nominee will fail to get the 51 votes needed to be confirmed to the lifetime position on the bench. Details herein, with input from top officials at NARAL and the Planned Parenthood Foundation, AEI's Norm Ornstein, Maine Women's Lobby head Eliza Townsend and former Collins staffer Lance Dustson. I last wrote about Collins in detail in December, in the aftermath of her divisive vote in favor of the Republican's tax cut measure. Read about her pattern of consistency here, and about her potential role as a check on presidential excess here. The folks at Business Insider have been kind to American Nations, re-upping their article on the paradigm a few times over the past couple of years, each time reaching a new cohort of readers previously unfamiliar with the book. Today they've also included it in this "11 Books That Will Make You Smarter About Politics," in the company of some heavy hitters like David Halberstam, Doris Kearns Goodwin, and Madeline Albright. So, thanks again BI! Partly as a result of their June 18 re-up, for those in the Badger State, I'll be the guest on Wisconsin Public Radio's statewide morning show July 4, 7 to 8 am Central, talking about the American Nations framework and the lessons it brings us. Tune in if you're there! I've been covering the Maine delegation's stance and reaction to the Trump administration's separation of migrant children from their families and the effort to reunify them for the Portland Press Herald. Rep. Bruce Poliquin, R-ME02, who for a time avoided discussing the issue, has taken a strong stance for immediate reunification, backing a new bill to that effect. Details in my story yesterday. My congressional representative here in Maine is heading to southmost Texas tomorrow to join a score of her colleagues touring federal detention centers where migrant children taken from their parents are being held. Her questions -- and the fact that they're all legitimate ones -- illustrate where we're at as a country: where are the detained girls? where are the detained babies? are reports that caregivers aren't allowed to touch or hug traumatized children true? Or that kids are being kept drugged to pacify them? how is the government going to reunite children -- especially babies -- with their families, particularly if the parents have already been deported? are they even going to? The central message of American Character was that liberal democracies fail when the balance between the two pillars of freedom -- individual liberty and the maintenance of the common good -- gets too far out of whack. Written in 2015, before Trump was considered a serious candidate, it warned that the US was in danger of falling into authoritarianism for this reason, and that all the warning signs were present. 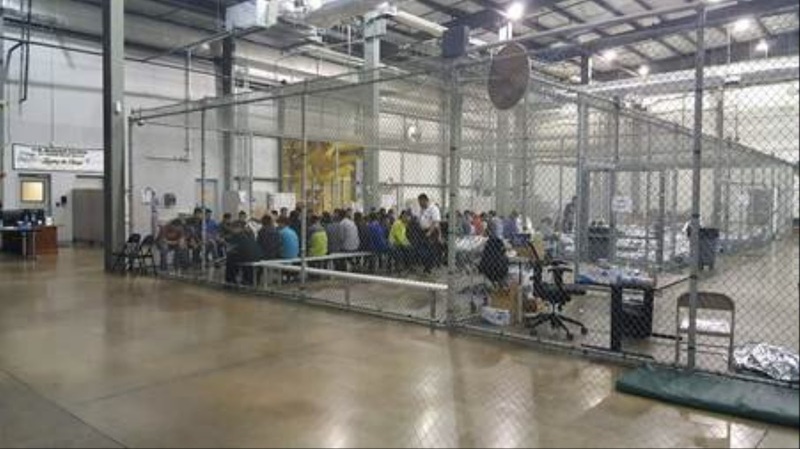 This week we learned that we're already there, replete with detention camps for babies and children, border agents effectively kidnapping children to terrorize migrants, and a stunning set of lies and reversals issued from the pulpits of the Trump administration on the issue. The federation is at a crossroads, and its soul at stake. Let's hope we pass through in one piece. This November, Californians will be asked if they want to split their state into three, a measure spearheaded by venture capitalist Tim Draper. I wrote about some of the problems Draper's borders present, in historical-cultural terms, over at Medium last month. But this week, I got to talk about an entirely different aspect of historical background on KQED's statewide "California Report": the lessons and precedents set by Maine's split from Massachusetts in 1820. Readers of The Lobster Coast are aware of the two entities were separate colonies back in the 1640s, when the English Civil War pit Royalist, Anglican, semi-feudal, West Country-dominated Maine against Puritan, Parliament-backing, East Anglia-settled Massachusetts. The execution of the King cleared the way for Boston to annex the Maine settlements, which they ruled as a colony -- the District of Maine -- for nearly 70 years. The War of 1812 -- when Massachusetts refused to defend eastern Maine or help the federal government rollback the British occupation of it -- was just the final blow to Commonwealth unity. But I digress. Here's a link to the audio of our interview, and here's the web story. (KQED is the San Francisco NPR affiliate, and one of the nation's public radio "superstations." 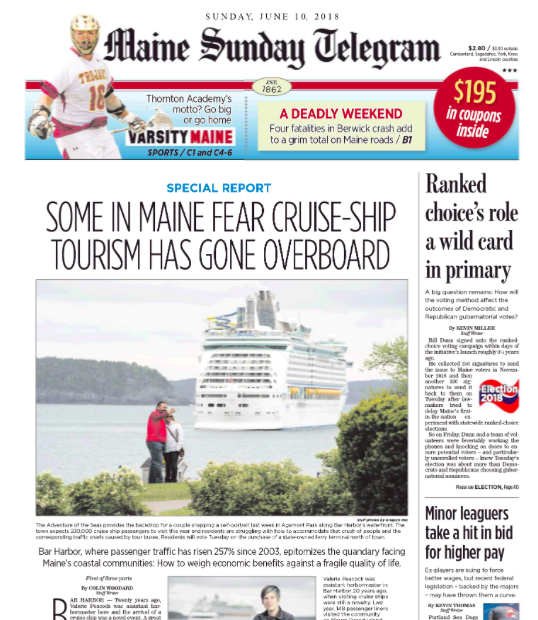 Over the past four months I've been at work on a series on the impact of cruise ship tourism in Maine, where most ports of call have a smaller year-around population than the compliment of the larger ships themselves. The results have been appearing in the Portland Press Herald and Maine Sunday Telegram this week, with the final part in today's paper. 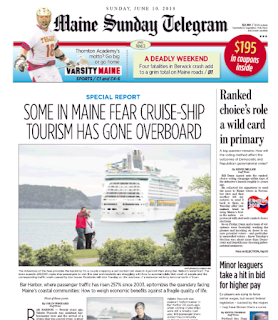 The bottom line for Maine communities: taking an ad hoc, reactive approach to cruise tourism has considerable dangers, but if you plan, prepare, and negotiate properly, you can get the outcomes your citizens want, rather than the ones that will just happen to them. Photos by the ever-awesome Greg Rec. In an unrelated note, my thanks to peers and colleagues in the Maine media for kindly recommending me to Pine Tree Watch's list of Maine's Most Trusted Journalists. The others so honored are my Press Herald colleagues (and, remarkably, immediate newsroom desk-neighbors) Mike Lowe, Eric Russell, and Bill Nemitz; Lewiston Sun-Journal managing editor Judy Meyer; Maine Public's Steve Mistler, Don Carrigan of WCSH-6/WLBZ-2, and the Bangor Daily News's Erin Rhoda, Chris Cousins, and Jake Bleiberg. All of us well know this is not an exhaustive list, as Maine is blessed with a great and varied press corps. 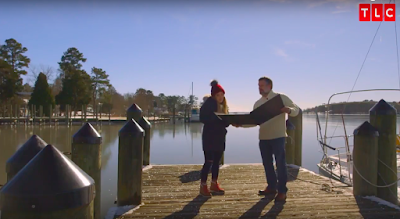 Talking pirates with Hilary Duff on TLC's Who Do You Think You Are? 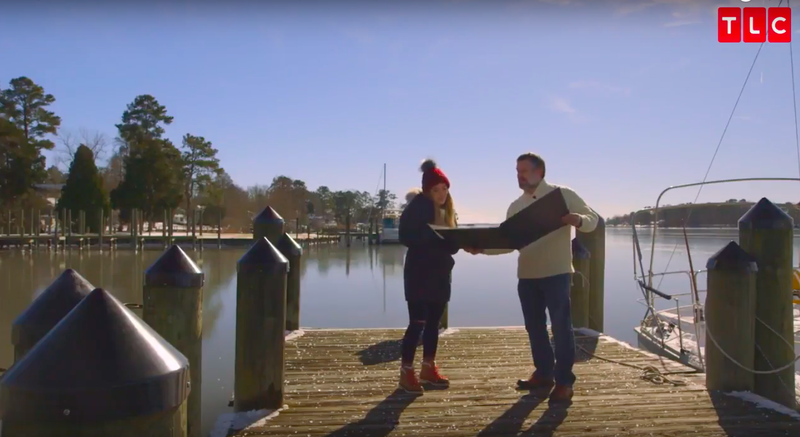 In an unlikely development, I recently returned to Blackbeard's Bath, North Carolina haunt to chat with actress Hilary Duff about one of her ancestors, the man responsible for the pirate's death 300 years ago this fall. Here's an extended clip of our conversation. The full episode -- S9:E4 -- is available here to US cable subscribers with TLC in their package. Thanks to the excellent team at Shed Media for an enjoyable mid-winter dive into piracy. I'll next be talking piracy in Nassau, site of the Bahamian pirate republic, in mid-July, on the occasion of the 300th anniversary of the pirates' downfall. Stay tuned for details. My next public talk is at the Chautauqua Institution in far western New York state July 3, on American Character. On July 3 I have the honor of speaking at the Chautauqua Institution's summer speaker series on the lake in Chautauqua, New York. The event kicks off at 2:30 pm in their Hall of Philosophy. I'll be talking about the issues raised in American Character: A History of the Epic Struggle Between Individual Liberty and the Common Good, which was a finalist for the 2017 Chautauqua Prize. The morning session just ahead of me is with Jelani Cobb of the New Yorker, so I'm looking forward to that as well. For those of you attending Chautauqua this season, I look forward to meeting. I am an award-winning journalist and author of American Nations, American Character, Ocean's End, The Lobster Coast, and The Republic of Pirates. I'm a staffer at the Portland Press Herald, where I won a 2012 George Polk Award for my investigative reporting and was named a 2016 Pulitzer Prize finalist.